These days, it seems that everyone is trying to be more environmentally conscious. Individuals are replacing incandescent light bulbs with compact fluorescent bulbs, and companies are recycling everything from paper to electronics. David Beatus ’01 has taken his dedication to the environment one step further than most, supporting the movement to “go green” by founding Green Promos Direct (www.greenpromosdirect.com). A division of Joy Products, Green Promos offers only eco-friendly and recycled promotional products. “After five years in the promotional products and ad specialty business, I saw an opportunity to serve a whole new and emerging market, the eco-friendly and environmentally responsible business gift and premium market,” Beatus says. Though most companies offer a few products, he recognized the need for a central place where clients could find environmentally friendly promotions. Although the Green Promos Web site went live in November 2007, Beatus timed its official launch to coincide with Earth Day 2008. The company now offers the largest selection of “green” promotional products in the country, including hundreds of items with varying degrees of eco-friendliness and recycled material. Beatus adds new offerings to the Web site every day, including everything from organic shirts and hats to recycled journals and folios to biodegradable and compostable plastic cups to lanyards and bags made from recycled soda bottles. 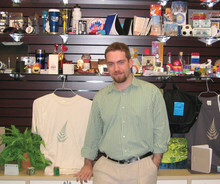 David Beatus ’01 with some of Green Promos’ offerings in the showroom of the company’s Port Washington, N.Y., office. Though finding new products and keeping up with technology (such as materials and recycling processes) can be challenging, Beatus says the process has been fun and educational. Enthusiastic responses to the products have increased demand from devoted clients, including Barnard College. While Beatus hopes to return to Columbia for an M.B.A., Green Promos is keeping him busy in Port Washington, where he lives with his wife and their Wheaten Terrier puppy. Beatus scours the world looking for new products, devoting the company to genuinely “green” offerings.